As she asserts absolute control over her image and most parts of English government, Queen Elizabeth I decrees a competition for a royal portrait. Political, yes, competitive, certainly, but it also proves unexpectedly dangerous. Moving her court from London to Nonesuch Palace, her father’s whimsical architectural masterpiece in the country—where she can keep a close eye on her elderly companion, Lady Katherine Ashley, who’s being cared for by nursemaid Floris Minton—the queen sits for portraits by three painters: Lavinia Teerlinc, Will Kendale, and Henry Heatherly. Much to the artists’ displeasure, Elizabeth’s protégé, young painter Gilbert Sharp, joins the competition upon returning from an Italian apprenticeship. When Kendale’s tent in the encampment outside Nonesuch goes up in flames, killing the painter and his boy-toy, Elizabeth commands the skills of scientist John Dee, who notices an unusual burn pattern and a trussed-up exit, clues that point to arson and murder courtesy of an exotic incendiary device. 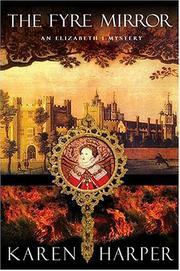 Elizabeth, haunted by memories of a fire in her youth, resumes her unlikely and anachronistic role as detective, worrying as signs point in turn to Gil, to Dee’s pretty second wife, and even back to injustices perpetrated by her father, Henry VIII. Elizabeth (The Queene’s Christmas, 2003, etc.) makes an appealingly courageous detective if you can swallow Harper’s anachronistic portrait of the monarch as action hero.